Powell-Peralta Rodney Mullen freestyle deck, circa 1985. Indy freestyle trucks, Bones freestyle wheels. All original (presumably the nose skid is around here somewhere). I rode this a ton, but religiously restricted to freestyle on a basketball court or other smooth surface, so it is in good shape. Note the vintage Geek Attack 'zine sticker on the tail. This is the jewel of the collection -- Rodney Mullen is the most innovative, influential skater of all time. Freestyle skating ceased to exist soon after this point, but everyone soon realized that it had devoured street skating from the inside out. 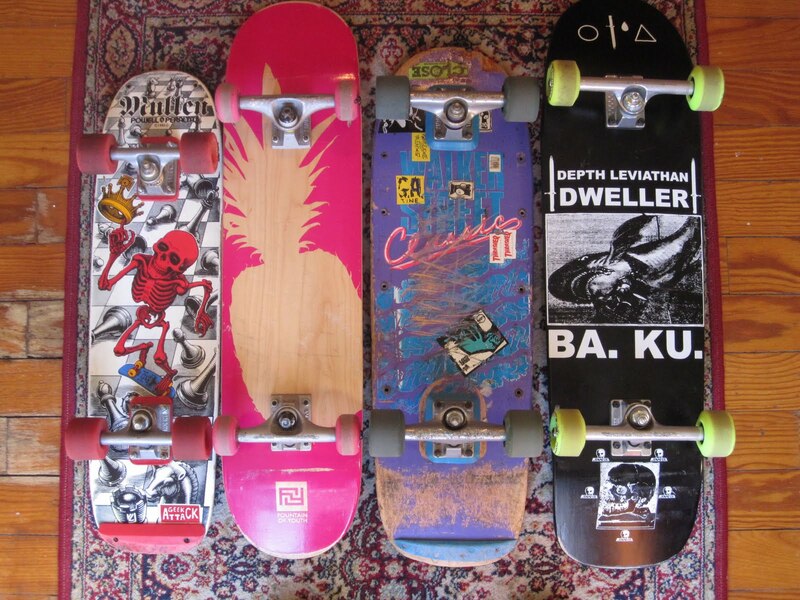 Fountain of Youth shop deck, circa 2010. Thunder trucks, Autobahn wheels. I picked this up at Donny Barley's shop in Providence. I picked it up when Vivian started riding her tricycle around the local basketball court, so I figured I should try a little neo-freestyle to occupy myself. I got hard (97A) little wheels on this thing which renders it nearly unridable on the rough streets and sidewalks around here, so this board hasn't quite found its niche. Walker Street Classic, circa 1986? Indy 159's, Kryptonics Pro III 92.5A wheels. I'm doing a public service here because I can't find another picture of or reference to the Walker Street Classic on the web. This followed my pattern of selecting obscure street decks with functional shapes from non-California companies. Perhaps of some interest to the Walker completist. Also note the Neil Blender sticker. This was the board I was riding in college as my interest in skating gave way to spending all my time at WRCT. It is a 9" deck and the one I've been using at Neutaconkanut Park. I need the extra wood under my feet if I'm going to skate a concrete park. Skull Skates BA. KU. Depth Leviathan Dweller deck, circa 2010. Ace 55's. Rainskates Killer Bees. Rock 'n' Ron's Rockets bearings. This is the ultimate over-researched new old-school or old new-school transition deck for the rider with a taste for obscurity, small skater-owned companies, monsters from the deep, and Satan. 9" wide, tall-ish hard Alaskan wheels, a broad expanse of truck for grinds. After receiving it at Christmas, I tried it a few times in the park in Huntingdon, and I'm quite happy with the choice. I'll be stopping tomorrow at Neutaconkanut on the way home from pre-school with the Dweller, a broom, a shovel, and a heart full of hope (and thanks to my ever-tolerant wife).